Producers enrolled in the Irrigation Assessment Program will receive water level measurements at the beginning and end of the growing season, as well as ultrasonic flow rates on wells and irrigation systems in the program. The High Plains Underground Water Conservation District is now enrolling producers for participation in its 2018 Irrigation Assessment Program. Since the program's reinstatement in 2013, cooperating producers have volunteered to have their center pivot or subsurface drip irrigation system evaluated by HPWD staff. Water levels in wells are measured at the beginning and end of the growing season. In addition, flow rates of the wells/irrigation systems are checked with an ultrasonic flow meter. This service is provided by HPWD at no cost to willing participants. The pumping hours, total gallons of water per minute, and the number of irrigated acres are calculated to determine the total acre-inches of groundwater applied during the growing season. Rainfall totals are determined through the use of radar estimates from April to September. This gives an estimate of the total inches of water available for plant use. Water samples are also collected as an extra service to those participating in the program. HPWD is able to check Total Dissolved Solids (TDS), chloride, and pH levels of groundwater. It is important to understand water chemistry since it impacts the efficient use of supplemental nutrients applied to crops. All this information is used to better understand the groundwater conditions in aquifers within the HPWD service area. For example, the 2017 program participants' well data reveals an average depth-to-water of 216 feet and an average flow rate of 110 gallons per minute. The average amount of irrigation water applied in 2017 by program participants was 6.6 inches for cotton, 9.9 inches for wheat, 10.5 inches for peanuts, 11.8 inches for silage, and 12.2 inches for corn. All information gathered from each site is shared with program participants. Several producers have said the data has helped them better understand their irrigation system's performance. High Plains Water District encourages all interested producers to participate in the 2018 Irrigation Assessment Program. There are two major benefits. First, it helps farmers understand how much water is used per year for crop production. Second, it provides beneficial data for future water planning efforts where accurate irrigation pumping information must be considered. AMARILLO – Drought is a given, and water from traditional sources will be limited in the future, but homeowners and businesses can “find” more water through conservation, according to a Texas A&M AgriLife Research environmental horticulturist. The 90.3 square miles within the city limits of Amarillo annually gets an average of twice as much water in rainfall as is demanded by residents for both indoor and outdoor use, said Daniel Cunningham, with Texas A&M AgriLife’s urban water program, Water University, in Dallas. “Water You Doing? West Texas” was the title of Cunningham’s presentation during the fourth biennial Texas Panhandle Water Conservation Symposium recently in Amarillo. Facilitiating behavior change and reducing water use is the goal of all the water education programs conducted through the Water University program at the Texas A&M AgriLife Research and Extension Center at Dallas. This is particularly important in times when there is limited rainfall, Cunningham said. Cunningham said as a state, the water supply of 15.2 million acre feet is expected to decline to 13.6 million acre feet at a time when population is expected to increase from 29.5 million to 51 million. When thinking conservation, understand that 41 percent of water use in the Dallas/Fort Worth Metroplex is outdoors, he said, adding that percentage is typical for many cities, including Amarillo. Techniques such as simple rainwater harvesting barrels or cisterns for homeowners; or maybe in a commercial setting, capturing as much water as possible and utilizing technology to filter it to drinking water quality or just to flush the toilets will help, Cunningham said. His suggestion is to trap some of the water to allow it to infiltrate, perhaps using curb cuts to catch water coming off a neighbor’s property and encouraging the water to slowly spread into depressions. Rain gardens engineered with gravel and pipes in the bottom and incorporating compost that acts as a sponge to hold the water is another option, Cunningham said. “Build landscapes as resilient as possible to drought, and we will be better off when those droughts do come,” he said. 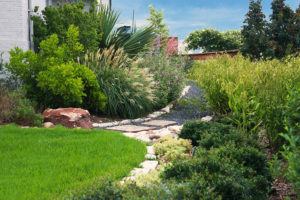 Some landscaping aspects homeowners should include are resources that decrease the need for water from a holistic standpoint: rainwater harvesting or greywater harvesting; native or adapted plants; pervious paving; edible landscaping; rain gardens; drip/efficient irrigation; and reduced lawn area. He said reducing the amount of turf, which can require a lot of water if managed the wrong way, to about a third of the area still allows for outdoor play. Incorporating water-efficient native or adapted plants and permeable hardscapes on the other two-thirds can increase the amount of water captured and provide it to the plants. Create healthy vibrant water-efficient landscapes without sacrificing aesthetics. Water deeply to promote deep and healthy roots. Frequent watering does not encourage deep root growth. Water slowly for better absorption. Use drip wherever possible and the “cycle and soak” method. Maintain 2-4 inches of mulch in flower, groundcover, garden and shrub areas to hold the water for a longer period of time. Install irrigation systems for efficient use per state and local specifications. Check irrigation systems monthly and make repairs and adjustments when needed. Cunningham said for more landscaping conservation information and ideas, go to https://Wateruniversity.tamu.edu. Students within the High Plains Underground Water Conservation District (HPWD) service area are encouraged to submit applications for the 2018-2019 Texas 4-H Water Ambassadors program. Deadline for submissions is May 20. Each year, high school age youth are selected to join the program which provides knowledge about management of water resources in Texas. “HPWD is proud to be among the supporters of the Texas 4-H Water Ambassadors program. This is a great opportunity to mentor future water leaders for our state,” said Carmon McCain, HPWD Information/Education Supervisor. HPWD provided grant funding for the program, which began in 2017. Those chosen will participate in a summer 4-H2O Youth Leadership Academy. This tour, set for July, allows students to meet with statewide water professionals and observe conservation practices. The group will visit the HPWD office in Lubbock during their tour of the Panhandle-South Plains region. In addition, the students will view rainwater harvesting installations at Samuel Jackson, Inc. in Lubbock and Bob Durham's ranch at Abernathy. A leadership, mentorship, and community service component is included as part of the program. Texas 4-H Water Ambassadors commit to a minimum of 40 hours of service during a 12-month period. This is earned by presenting water education programs to local 4-H clubs, schools, fairs, and other community events. In addition, the students may also assist their local water utilities, groundwater conservation districts, and County Extension Agents in their water outreach programs. Applicants must be 14 years old as of Aug. 31, 2018 and must be entering the 9th, 10th, or 11th grade in the upcoming 2018-2019 academic year. A short essay and letters of reference are required. There is a $250 participation fee due by June 20. Applicants do not have to be a current member of Texas 4-H, but must agree to become a 4-H member and pay a $25 annual membership fee, if selected.